really very nice indeed, i love the way you guys seem to keep listening to your customers and improving the product . Cool! After a few injuries, I've been experimenting with some old frames to see if I can accommodate them. Fat tire all rounders look great too me now. Wow. Totally gorgeous. Love the green, and it looks like a great frame spec. Can't wait to see the Pass Hunter. These look great! Ballpark MSRP yet? I live down five miles of Kansas farm road. You may've nailed me with this one. I look forward to seeing the specs. Have you determined an optimal tire width? The price is not set, maybe $550 or $600. It's heavy compared to a road bike, as a bike like this must be to survive. We'll see what the final weight is when we get the production version. Optimal tire width is 2.1" That's what we based the geometry on. Thank you for listening to our pleas for 1-1/8" headsets and horizontal rear drop-outs. I will never go back to derailleurs after using geared hubs. This is pretty much the bike that I've been seeking for gravel riding and mixed-surface touring. But the geometry will be the deciding factor, especially since it will determine whether I can ride the smallest 700c or the largest 26" model. have you ruled out disk brake mounts? I know they add complexity, but they are really nice in dirty conditions. I would be regretting my recent Campeur purchase if I didn't already have a Rawland Drakkar, which is almost identical except for disc brakes. Oh wow! And just when I was all set to buy a Surly Ogre. The decision is much tougher now. That bike will build into a gorgeous retro MTB. Love the bi-plane fork - just like the early Stumpjumper! Well done, Chris. When do you expect to post a geo chart? I'd love to build one of these using all vintage MTB parts! However, what I'm really waiting on is a 650b Campeur frameset. Very interesting looking frame you got there. The Campeur runs 700s across all frame sizes where as this frame runs 26s for sizes 53 and smaller. Curious as to the reasons? To the question of why I like internal hubs: they shift instantly and silently, whether pedaling, coasting, or standing still; need no finicky adjustment; always keep the chain in perfect alignment, and never jam. I have used an Alfine 8 for three years with no problems. The advantage to horizontal drop-outs is that chain tension can be easily adjusted. Geometry charts will not be available until they go into production. This is because we may still make some changes and for "competitive reasons". But you'll get a pretty good idea of geometry as soon as I post the photos of built-up bikes. The big tires and higher BB mean that we needed to use smaller wheels on the smaller sizes. We will also have smaller Campeur frames with 26" wheels. We're shooting for mid-winter availability. sloping top tube or parallel to the ground? FINALLY a bike that is guaranteed to plane. Can't wait to read the BQ review! Looks like an exquisite frame, and I am a fan of the green. "There was something neat and high-bred, a quakerish elegance, about the rogue that hit my fancy on the spot.'" The more I study this frame, the more I think you have created a real winner. 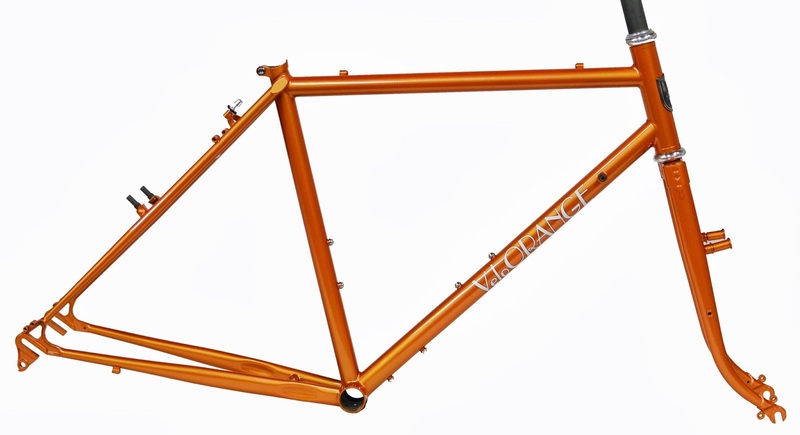 This frame will suit everything from an urban fixie to a cross-country tourer. I especially like the fat-tire ability, high head tube, wide range of sizes, and horizontal drop-outs. But please reconsider the insipid color. This bike looks awesome. 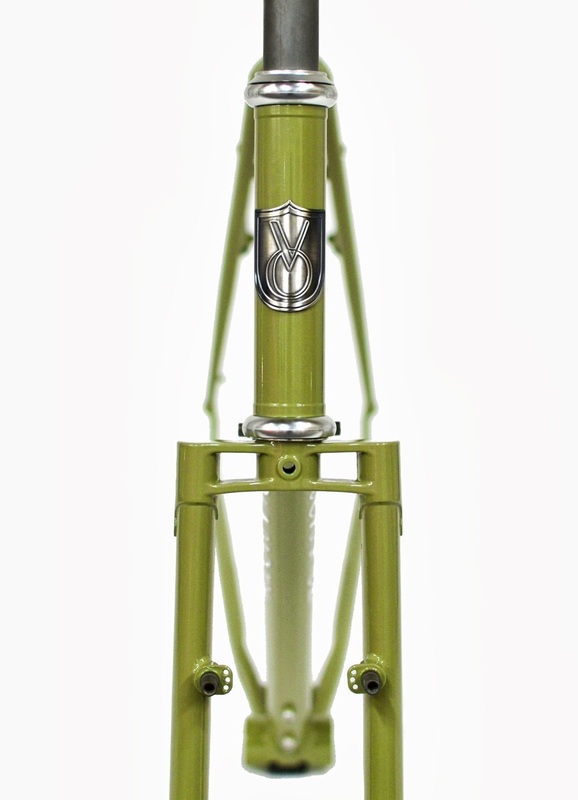 The fork is the same as what Mountain Tour- a newish bike company in San Francisco is using. Can't wait to see as this project develops. There is some slope to the top tube. With the high BB and tire size a level TT would put certain parts of one's anatomy in great peril. There are some minor advantages to disc brakes, but getting them fixed in remote areas is the big drawback as I see it. 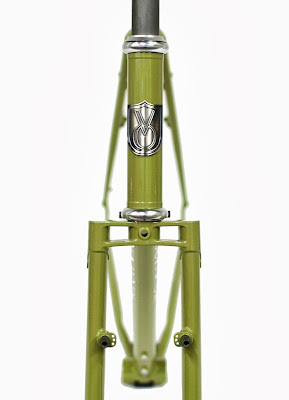 Any shop will have a v-brake or canti in stock. The fork was designed by VO, though it's not hard to design similar one. Mountain Tour, if I recall, was the name of a crappy brand of ATBs sold by now-defunct Canadian department store Eaton's. I would like to see the offerings from this new SF-based company. Do you have a link? That is one fantastic looking frame!!! Kudos to what looks to be a real winner.The headset spec makes solid sense in more ways than one.... a good decision. 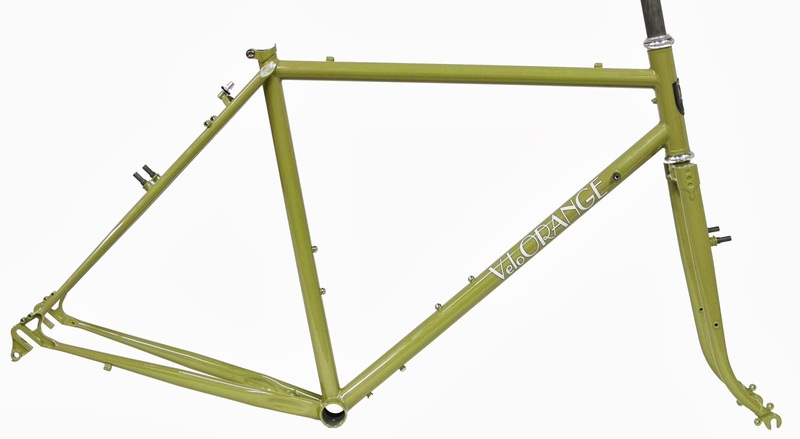 An impressive frameset that fits a developing - and underserved - niche in bicycle design. Impressive. Can't wait to see them available for purchase. this is exactly what i've been looking for! I cannot wait! Is there a red color in the works? I really dig the "biplane" fork crown. That is a masterful touch. If only I had more room in my house I'd buy one of each of your frames when they come out and build them up. Chris: Delighted to see you built your new bike with internal gears. Please post your impressions. I am looking for a frame primarily for long distance road riding, commuting, maybe a longer brevet, and light weight road touring, but also want the ability to ride mixed surface routes and some bikepacking. Off-road use will be on fireroads and easier singletrack. Think White Rim or ACA Utah Cliffs Loop. Loaded weight will be pretty low, my base weight is around 15-20 pounds of gear (including bags and racks). Between road and dirt, road will be the primary use. Based on these interests would you recommend this new frame or the Campeur? It seems this new frame is more dirt first and road second, whereas the Campeur is the opposite. Both frames can ride either surface well but each is more oriented towards one versus the other? PS, I love the green color and biplane fork! +1 on the red over orange; your red is really nice. How about a classy steel-blue or a deep carmine color? That green will cost you sales for sure. I believe the different wheel sizes 53cm-26", 59cm-700c, would account for the similarity in headtube sizes. Yes? is the top tube length going to be short enough to run drop bars? Brian, I'd pick the Campeur based on your use. But, shoot us an e-mail or call if you need more info. 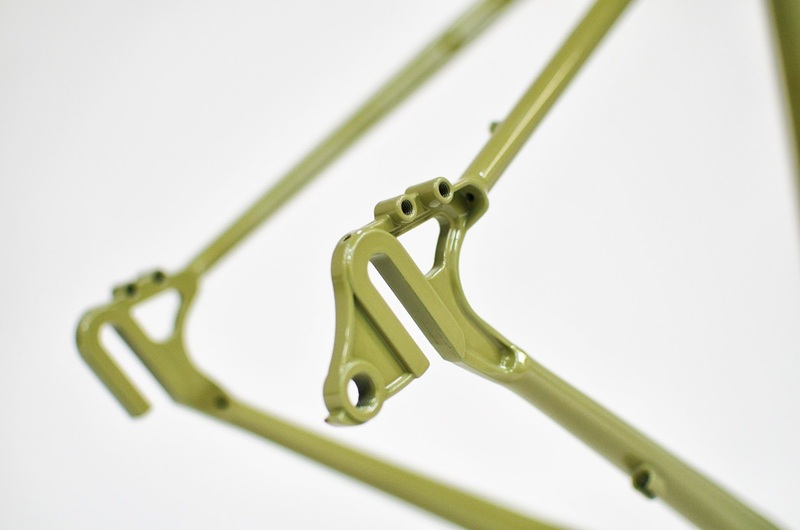 This frame is designed with drop bars in mind. I've been pondering a low trail 650b dirt path racer, maybe 3 or 5 IGH, 2" tires, flat/swept bars, with a porteur rack. This Camargue looks more like a mid-trail(?) design and perhaps the slack head angle is less appropriate for front-only loads? For basic usage, I could settle for a rear rack if that's better for the Camargue. But if it's top tube length is based on drop bars, then perhaps swept/flat bars just wouldn't pencil out for a typical 59cm fit? Chris, your comments above seem to point me in a different direction, yet your photos of the IGH and wacky flat bars tempt me to consider this frame based on my wants. Comments? Well done. All the appropriate braze-ons and clearance for a true all-rounder. This could possibly be a replacement for my beloved 700c LHT which is pretty perfect. So...you'll be offering 26" wheels then? Is there a possibility, that I could fit Sram Omnium 48T crankset on this frame ? And, if possible, could you post maximum and optimum tire size in millimeters, because "inches" differ from one manufacturer to another. Omniums will not work. They are track cranksets designed for small tire clearances and narrow chainlines, both of which are not this frame. The frame is designed around 29x2.1 and that is a true, ideal world 2.1. Clement XC XLV measure 53mm and they are great all-rounders. Looks like a great frame, some interesting ideas. I would make a few tweaks, not least of while would be 6mm bolts for the rack mounts. The 5 is derived from the original fenders. Racks went on with p clips, or something of the sort. However, it is unlikely anyone would thank you for the change. Better get this baby out before the stock market craters again. Like the orange OK. Wish more for something like a French blue and hate that particular shade of green. But I've got too much going to build a gravel grinder for another year or so anyway....Someday.